Our yoga is so important but it doesn’t have to be serious. Pick the class for you and come have some fun while you de-stress and recharge! This is a beginning yoga series that introduces students to yoga basics (etiquette, poses, breath work) and goes over what to expect in a typical yoga class. It is designed to get students comfortable and ready for other classes on our regular schedule. This is a 4 week series that typically starts the first Tuesday of every month at 5:30-6:45PM. While this class is meant for the beginning student, all levels are welcome. Limited space. Registration suggested. This weekly class encourages time to practice quieting and stilling the body and mind giving you the opportunity to rest and restore. It is appropriate for all levels and designed to help you begin or maintain your own personal home meditation practice. Meditations will vary from week to week including mindfulness meditation, loving kindness meditation, guided meditation, silent meditation, and more. While very similar to our Slow Flow Class, in this class many modifications are offered and props are used to help support the practice as needed. Great class for beginners. All levels welcome. This class is designed to slow down the flow to the subtle muscle actions in each posture to give time to work us from the inside out. This is a gentle class and great for beginners. All levels are welcome. This class will include a relaxing seated sequence, restorative in nature. Using long, passive holds (3 to 5 minutes), this class settles you into poses that can increase flexibility, restore and rehabilitate the joints and muscles, and teach the body to surrender and the mind to quiet. All levels are welcome. Ashtanga yoga involves synchronizing the breath with a progressive series of postures. Using the breath as a vehicle, the student is guided through a series of poses specifically designed to cultivate balance, strength, and flexibility. This class is suitable for intermediate to advanced students. Vinyasa is a blanket term used by yogis to describe a multi-disciplinary class, which focuses on alignment and breath awareness while flowing from one posture to the next. Using sun salutations and breath-linked movement to transition from one pose to the next, this class allows students to flow and focus on their breath while detoxing the body, mind and spirit. All levels are welcome. Ashtanga yoga involves synchronizing the breath with a progressive series of postures. Rooted in ancient India, the physical practice of ashtanga yoga has developed over the ages into a science of the human body. Using the breath as a vehicle, the student is guided through a series of poses specifically designed to cultivate balance, strength, and flexibility while detoxing the body from the inside out – physically, mentally and spiritually. Ashtanga is a tool for self observation and nurtures peace of mind. Intermediate to advanced level class. Not intended for beginning students. Our chakras are the gateway where our karmic soul, emotions and physical bodies intersect, thus producing how we react, feel, live and interact with others. As life happens day-to-day, we take on so much emotional and mental garbage that we store away in these various chakras, leaving us bogged down, overwhelmed and exhausted by the end of the week. In this traditional power class, we will take a specific focus toward cleansing, detoxing and empowering the chakras needing our attention on that particular day, leaving us feeling more clear, relaxed, balanced and peaceful. 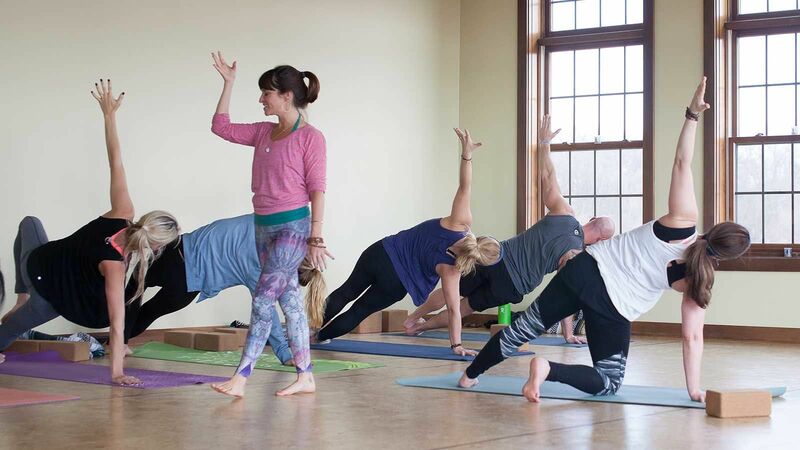 Class is similar in format to a traditional vinyasa yoga class, just with a more specific intention. Intermediate level. Vinyasa is a blanket term used by yogis to describe a multi-disciplinary class, which focuses on alignment and breath awareness while flowing from one posture to the next. Using sun salutations and breath-linked movement to transition from one pose to the next, this class allows students to flow and focus on their breath while detoxing the body, mind and spirit. In the heated classes, the room is heated from 90-95 degrees. This class is suitable for intermediate to advanced students. This class is not taught to all levels – it is an advanced power yoga class recommended for advanced students only.